Ease the clumsiness of having to hold your tablet with both hands with this universal hand strap. The specially formulated pass-through MagConnect port is designed to work with any Joy Factory MagConnect mount without having to remove the hand strap. 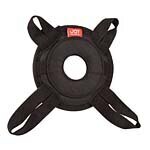 The Universal Grip Hand Strap is designed specifically for the MagConnect LockDown Secure Case SGM101 and SGM101KL only. This hand strap is ideal for carrying this case while on the go. It accommodates both portrait and landscape viewing modes easily.